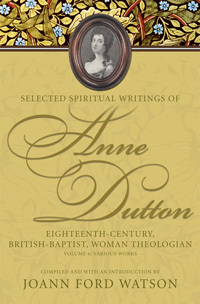 Volume 6 of Anne Dutton’s writings, Various Works, rounds out the available letters of this prolific correspondent and spiritual writer and theologian. These collections of letters show her wide audience in the eighteenth century. Unique in this volume are her letters about the Moravian Brethren, A Postscript to a Letter Lately Published on the Duty and Privilege of a Believer (1746). It was directed to the Moravian Brethren and Whitefield’s followers who joined them, and includes Dutton’s disputes against their doctrines and practices. Dutton’s wider audience included relatives and friends, and this volume includes a reprint of the 1823/1824 edition by T. Bensley, Letters on Spiritual Subjects: Sent to Relations and Friends. Thus her works were read into the nineteenth century and have now been rediscovered as offering great spiritual advice and depth. Also included in this volume is her Letters Sent to an Honourable Gentleman for the Encouragement of the Faith (1743), a letter probably sent to George Whitefield. It demonstrates her spiritual counsel and spirit of encouragement in the faith.